If you're a resident of the city of Chicago, chances are you've noticed street artist illustrator and fine art painter, Hebru Brantely has taken on the Chicago art scene by storm. 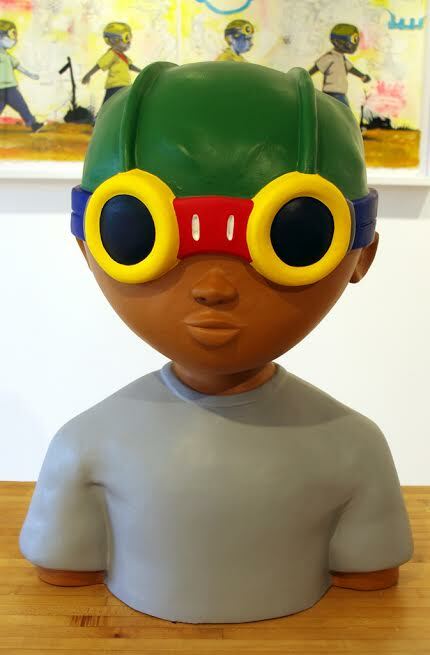 Not only will you find him in galleries, such as Vertical Gallery in Bucktown, but you can also find his art popping up all over Chicago neighborhoods - just keep an eye out for his signature style and acclaimed characters, such as his anime inspired "Fly Boy, Fly Girl and Friends." Friday June 6th marked the opening of Hebru's solo exhibition "Memoirs of the Minimum Wage" at Vertical Gallery, a cozy Bucktown gallery that caters to urban, contemporary and street art. This date also marked the completion of Brantley's recent addition to the Wabash Arts Corridor titled, "Chi Boy." Brantely joins the likes of Shepard Fairey (OBEY series, Obama HOPE), Celon Peterson, POSE and RETNA who already have large-scale artworks featured indefinitely as part of the Wabash Arts Corridor. The mural "Chi Boy" is part of the growth and expansion of Chicago's major emerging art scene in the South Loop, though it is far from the first outdoor mural composed by the artist who has numerous works across the city and was commissioned by Nike in the past to create a mural on the side of their Bucktown location. At his solo show you will find sketch book illustrations of comic super heroes re-envisioned as children of different races springing to life in color and composition. 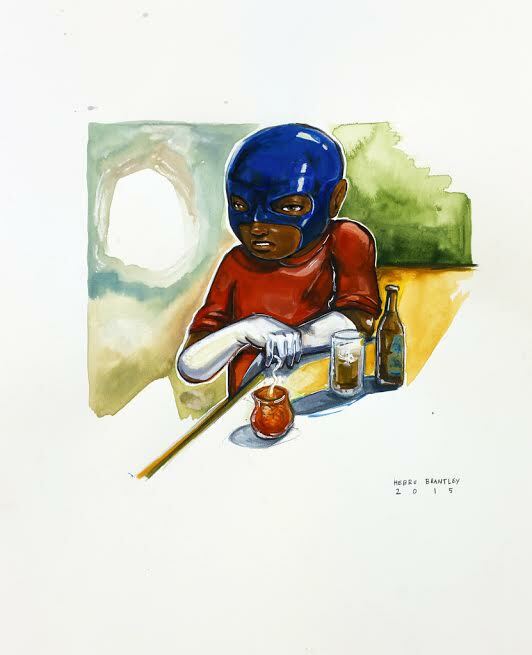 These playful images read nostalgic renderings of a past 80s culture but hold relevance today with surprising titles such as "Sleepy Folks who use to live on the low end that shot Darius brother" and "Sky High (No Money for Cocaine)" or "Off Duty" the title of a mixed media painting depicting an off duty super hero drinking alone at a bar. Brantely's work evokes aspects of magical realism in how it convinces the viewer to accept magic in an otherwise rational world. Brantley's narratives offer an insight on his life and the lives of his peers growing up on the South Side of Chicago but in a way that is fragmented by fantasy. The characters embody childhood imagination paired with often bleak realities that these heroes must overcome. The work on exhibition at Vertical Gallery is much smaller-scale than works I've seen of Brantely's in the past, whether in pop up shows or as installations such his "The Watch" a sixteen figure sculpture arrangement erected on Michigan Avenue featuring a variety of colorful young super heroes. Though the size is significantly scaled back in comparison, the work remains as powerful as ever. These intimate mixed media works read as childhood illustrations, created in a variety of mediums that include acrylic paint on canvas, water color and ink, charcoal on paper, resin and acrylic sculptures and limited edition screen prints. Each image is construed in the same world, a colorful cartoon-land with endless possibilities coexisting with harsh realities. Hebru is honest when portraying his hometown of Chicago, a city with a lot of talent, passion and promise that is still suffering from violence, poverty and corruption. 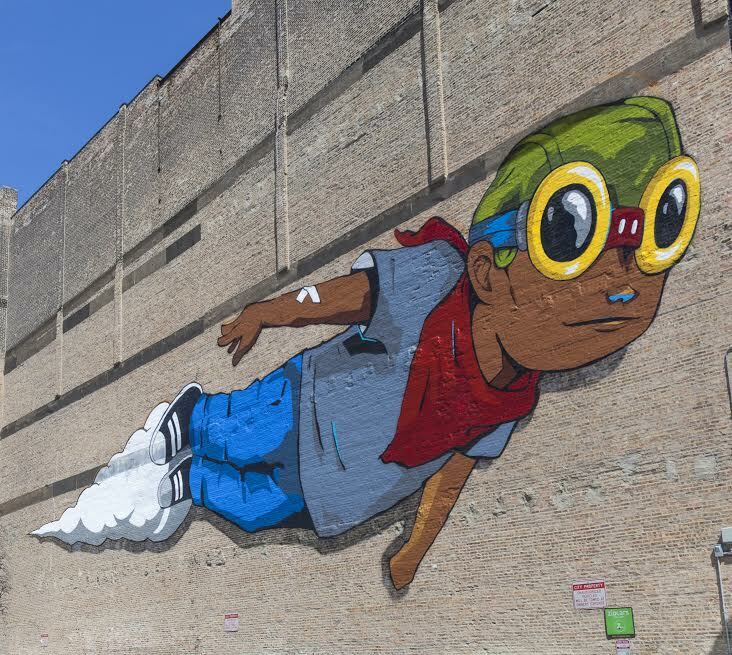 In a lot of ways Hebru Brantley takes on the role of an art activist with his works, for instance, "The Watch" the installation mentioned above was Hebru's contribution to Chicago Ideas Week. 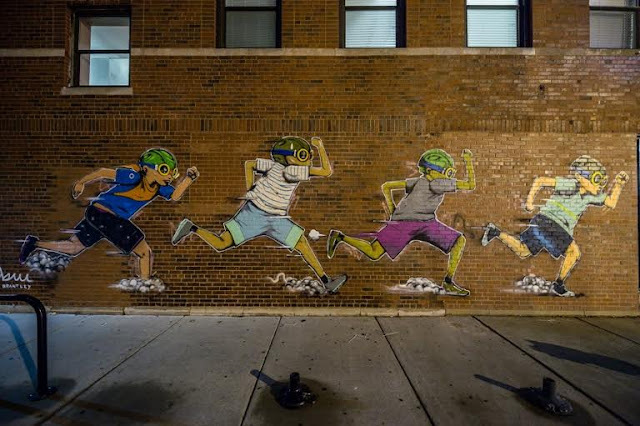 The work is meant to represent the troubles youths face in Chicago neighborhoods. In fact, the work was inspired by conversations Brantely had with students from Chicago Public High Schools that are part of Chicago Ideas Week YOU(th) program. 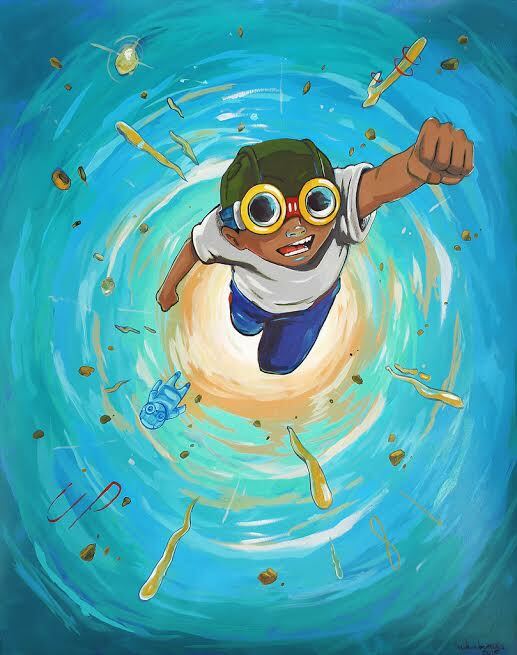 "The Watch" both act as metaphor for the student's ability to rise above challenges in the urban environment while also paying homage to the Tuskegee Airmen, the first African-American military aviators who fought in World War II as part of the United States armed forces. 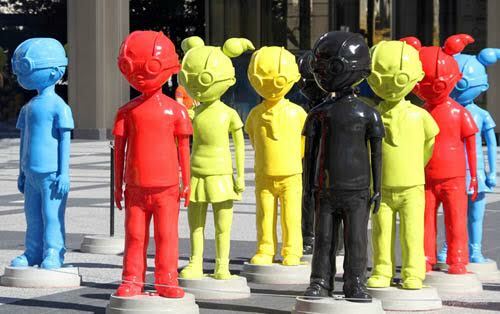 While this work focuses on social issues, it breeds optimism for Chicago's youth. When thinking of colorful, visually pleasing art that transcends a thoughtful message to the viewer I can't help but to also think of Darryll Schiff's The Parade Commences as part of his "Descending to Heaven" series, a photographic body of work that reflects on the way humanity is easily swept up in ideals and movements. Often times people find themselves eager to follow like flocks of sheep, whether it's an articulate dictator or Ghandi leading them. The works serve as an expression of mankind, moving out of the darkness to further enlightenment. But Schiff allows for the viewer to interpret themselves, whether it is true enlightenment or a false belief. Schiff hopes to convey through this piece a bright side to humanity, as it calls upon viewers to reflect on the prophets we follow and the paths we choose freely. The work reminds individuals that power comes from movement, but we must think introspectively and see true good before we can follow blindly.